The Jock Tax Index (JTI) is a new proprietary tool and has been featured in “Off the Charts” by Scarlet Fu on Bloomberg Television’s Market Crashers. 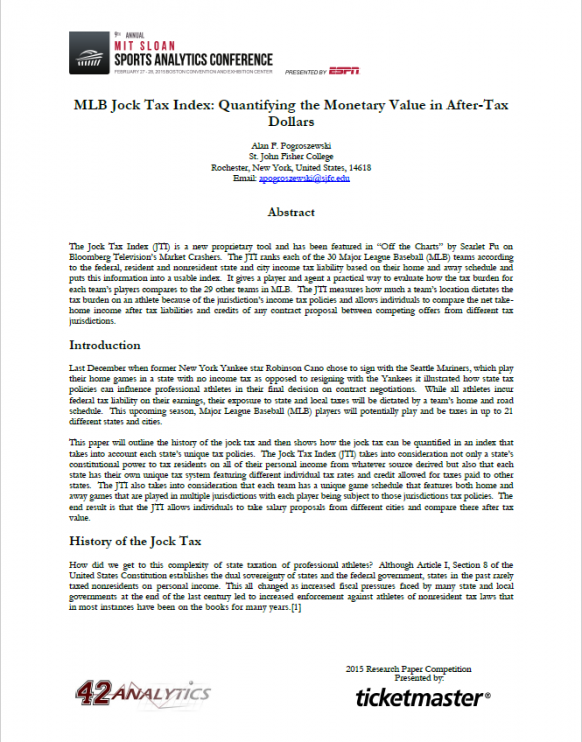 The JTI ranks each of the 30 Major League Baseball (MLB) teams according to the federal, resident and nonresident state and city income tax liability based on their home and away schedule and puts this information into a usable index. It gives a player and agent a practical way to evaluate how the tax burden for each team’s players compares to the 29 other teams in MLB. The JTI measures how much a team’s location dictates the tax burden on an athlete because of the jurisdiction’s income tax policies and allows individuals to compare the net take-home income after tax liabilities and credits of any contract proposal between competing offers from different tax jurisdictions.